Millions of people have benefited from Traditional Moo Doe around the world. Over the centuries Traditional Moo Doe has proven to be one of the quickest and safest ways for all individuals to achieve incredible strength and an outstanding condition. For over 30 years in the United States alone, Oom Yung Doe has had a 98% satisfaction rate. Oom Yung Doe continues to help millions of lives by building a strong foundation based upon Moo Doe principles, therefore giving everyone the opportunity to improve themselves. The majority of students comment that Moo Doe training is the best investment they have made for their improvement. I have gained much from this seminar. The instruction has been excellent, there has been a strong feeling of community, and I feel much stronger and more aware than before. For the first time I believe I have a basic understanding of the mind-body-spirit connection. The training has been wonderful, exciting, challenging, and liberating. I have learned more about myself, and I am anxious to attend next year’s seminar. I would like to offer my sincerest thanks to Grandmaster Kim and the international team for this opportunity. I have to say that this weeklong has by far improved me in so many different aspects more that any training I have previously had. I feel tremendously positive and my outlook on my training is very ambitious. The unexplainable experiences that I have felt have given me tremendous inspiration and faith. 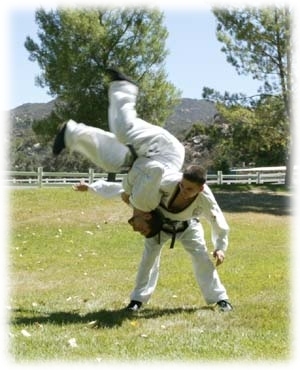 Besides the vast improvement in my physical skill and ability I have experienced perhaps a glimpse of what the higher belts and Grandmaster experience every day. Through my Nae Shim Gong I have at last truly connected and have begun the most important part of my training, and that is the spiritual part. Never did I think that I would even experience a fraction of what I have at my level. Through constant meditation I have seen various imagery unexplainable on a generic level of understanding. I often perceive momentary images of many plants, insects and animals. I have also seen people’s faces that are absolutely foreign to me, yet very detailed. As I meditate I seem to lose sense of time and where I am. Often when I finish it has felt like 10 minutes until I come to find it has been almost 2 hours. Besides the unexplainable imagery I have felt purity and peace. The world around me seems to become alive and vibrant with energy and aura. In one instance as I rose from meditation I began to nervously shake because the aura of the natural setting around was felt tremendously. As I walked by the higher belts I sensed a great aura of energy and the temptation to stare was irresistible. Also I sensed that their energies were conscious of me even when I was not looking. This is because it had nothing to do with sight but more a sensitivity and understanding of energy. To put my experience into words seems to degrade the true grandeur of it and to the average person I must sound mentally insane. However, my experiences are real and my outlook on my training is forever changed. True greatness really is invisible. The most recent weeklong seminar was one of the most profound experiences of my life. I have been to the last 6 week longs and each was more powerful than the last, but this was unlike anything I have experienced before. The meditation practiced allowed me to see life in a way I never realized was possible. I am going through so many different experiences in my meditation that I stopped trying to remember them all. I am seeing nature in a different light, in a different way. I am beginning to understand more about life and I can see with more than just my eyes. I feel like I have an extra sense that feels joy, peace, and light from everything around me. To be truly honest it can be almost distracting at times, I feel so much joy and so content it would be easy to sit and meditate for all of my waking hours. At the same time, though, I am filled with a renewed drive to use what I have gained to help those around me. To take the light I have found and share it with others, to help them find their own light. I want to thank Grandmaster ‘Iron’ Kim for passing on these methods so that Instructors, students, and their families can find this peace, joy, and light. I am starting to realize what a gift and a treasure that is. I am grateful for the opportunity to meet different instructors and students from around the country and make new friends. Everyone showed care and concern for each other, an example of what the line represents. There was a tremendous strength in bringing everyone together, and I believe that the challenge now is for everyone to bring this strength back to their areas and share it with others, just as Grandmaster spoke of the importance of learning and earning. After practicing the movements from last year’s weeklong, I quickly accelerated in my training. 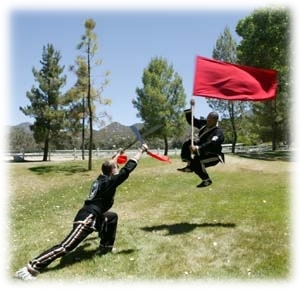 My ability and skill in movement and execution of higher level forms accelerated and far surpassed my expectation. I felt so much joy and positive energy from ’06 weeklong that it had helped me maintain my composure and strength during a windstorm upon coming back home. The most important thing that I feel from the weeklong practice is the positive perspective that I have gotten. Before training, mental and physical ailments have catapulted my life in a downhill spiral, but Oom Yung Doe’s gave me the mental and physical strength to overcome. The most remarkable part of my training has always been the weeklong seminar. I can only imagine, with this year’s weeklong movements far surpassing the depth of the year prior what sort of remarkable impact it will have on my training as I head back home. This weeklong was an incredible experience for me. Getting here was a big challenge but now that I’m here and the week is coming to a close I realize it was worth the headaches to get here plus more. The energy here is very strong and after five days of practice and meditation you can really feel the strength of the energies around you. All of the negative thoughts I usually have from a day to day basis slowly began to fade away and a very peaceful feeling of positives have seemed to take its place. With such this positive outlook on things I’m starting to see everything differently, more for what things truly are. With this new refreshment of energy I feel I will be able to handle many of the struggles I face with my reality back home. I don’t know where I would be or what I would do with my life if Grandmaster never decided to teach in this country. Words can’t explain my gratitude so all I can say is I will definitely be back next year. I already feel increased strength in my legs and some increased flexibility – the 1st time I’ve been able to do low side fugal on both sides! It’s also a joy to occasionally feel some fluidity in movement. With Nae Shim Gong: I am reminded how important it is to acknowledge and release the deep sadness within me; to continue being delighted with “small” things; and to maintain awareness of my connection with nature. This has been an amazing week. I was able to meditate deeper and longer than I ever have. Last year I was able to achieve a feeling of euphoria at the end of the week, but this year I was able to achieve that feeling every day. I had many interesting experiences including having my body feel tingly all over and having my brain feel as though it was being massaged. I feel like I have a better understanding of meditation, how to do it more properly, and how it will benefit me in my life. I feel that continuing my meditation practice will help improve my mental strength. I have a better understanding of where I am going and how to get there. Thank you to Grandmaster and higher belts for helping me achieve this. I have truly benefited and so will everyone around me. I am leaving this weeklong feeling charged and renewed. My body feels great from the movement and I feel full of calm energy. I appreciate the care and patience of the Instructors as they guided me through the week. I have gone further in my meditation in a very short time. Thank you to Grandmaster and the higher belts. 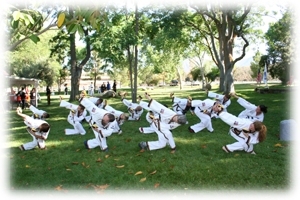 I was really challenge and encouraged by Grandmaster and higher belts mentally and spiritually. Hearing that I can change my reality and become stronger mental, physically and spiritually is finally sinking in. Thank you. I found this weeklong seminar to be extremely relaxing. 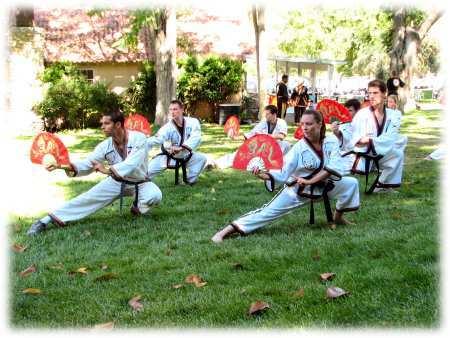 The grace of the movements combined with the Nae Shim Gong really seemed to foster a feeling within me of great sense of peace and tranquility. I also experienced a lot of movement of internal energy inside my body; at one point during a Bagwa walk, it felt as if my hands were on fire. So there was no mistaking the strength of the movements. 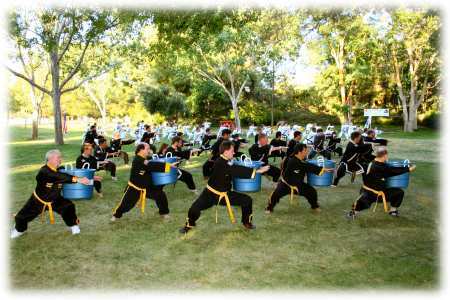 The 2007 Oom Yung Doe Weeklong Seminar showed me how much I need to focus on my internal strength. The first day I was detoxing so much from inside that I was fatigued from the cleansing process. On the second and third day I had this enormous burst of calm energy. I felt more alert, more awake, more alive. The weeklong seminar provided me a much deeper understanding of what it means to put my mind into my practice and in everything I do. The meditation practice was incredible for me. During one of my meditations I experienced a guided trip of visions taking me from a beautiful path in a forest to a large fire and on to meeting with myself for a brief moment. I have enjoyed very much participating in the Oom Yung Doe community where each person cares very much for the other person. This being my first weeklong, I would recommend it to every student of Oom Yung Doe. No matter how hard I try, stress builds up over time and began to affect my mind, body and health. It is hard to remove this stress on our own. However, the weeklong seminar not only removed my physical stress but allowed my mind to relax as well. I look and feel better. In hindsight, I could not imagine not attending. 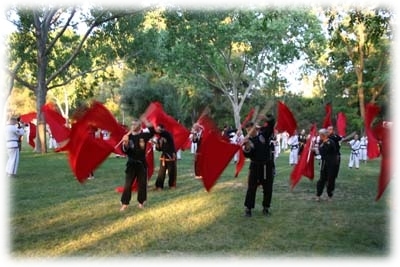 The 2007 Weeklong Seminar was a very special experience for me. Through the training and meditation I was able to completely rebalance my condition physically, mentally and spiritually. I literally feel reborn. The inner peace I found, is something many strive for, but struggle to actually achieve. I sincerely thank Grandmaster “Iron” Kim and the Higher Belts for helping me accomplish this greater state of well being. The training and environment were great as always. I look forward to seeing the results of practicing such powerful internal movement and reaching deeper spiritual levels with Nae Shim Gong. However, what I’ll take away the most from this weeklong, is how much meaning and principal goes behind everything in Moo Doe. It’s beginning to sink in how much we can affect ourselves, our schools, our lives and our world. I would like to thank Grandmaster and higher belts for their unwavering leadership and compassion they show for all of use. I find great inspiration in the example they set from us to follow. This weeklong was the first I’ve attended and each day I experienced an increasing sense of balance and well-being. I expect this was in direct relationship to the purifying process occurring within me. I was immersed in a beautiful and supportive environment and community. The movement received and instruction on Moo Doe Principles moved me through various physical and mental resistances. The final meditation changed my perception of the world, initiating a new sense of wonder. This year was my first weeklong and every aspect of this week had exceeded all of my expectations. The experience has been invaluable and worth every bit of effort and energy I put into it. The movement was so strong, but the meditation, Nae Shim Gong, has been even more so and caused me to shed a very thick skin of negative energy. Now I am seeing, hearing and feeling things for the first time again and I owe it all to this incredible week. I’m so happy that I made it this year. I felt much better and more comfortable in this year than the last time. I wish the long week seminar would never ending. Hope to be here again and again and again my health condition getting better. Than you very much! On the first day of this Week Long, after learning Yuk Kun Kyong and Pal Gae the first thing in the morning, I literally felt like I could fly. My whole middle body felt like a hollow balloon, filled only with energy. 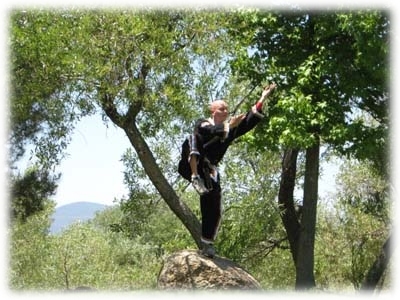 Then, after the next form (Rolling the Giant Stone), I almost had to tie my feet to the ground to keep from taking off. Three years ago I had some trouble that can only be described as a spiritual issue. I thought it was resolved and had not thought on it for years. In my meditation of the Wednesday of the first week of the week long I was struck by the revelation that it was not resolved, but it was holding me back. It is probable that some physical issues I have had recently were also related to this (you will see why I say this later). I spoke to Head National Instructor Jerry and Assistant head National Instructor Joe. They gave me direction on how to deal with this. After I followed their direction I immediately felt the issue resolved. My next practice I felt full of energy and able to move like I haven’t been able to for years. My next meditation session went much smoother and felt meaningful for the first time in years. Even my flexibility improved significantly, better then it has ever been. This weeklong was important to me long before it arrived. Four weeks before, I intensified my practice. Two weeks before, probably as a result of that practice, accepted for the first time since I was a child that God existed. I had no idea at the time this weeklong was geared towards the spiritual. For the months leading up to the week, my Nae Shim Gong (NSG) practice was only twice a week or so – sitting with myself is more difficult than hard practice. I had a couple of experiences of all “hard” physical things being really only stiff liquid, and therefore a connection with every thing. 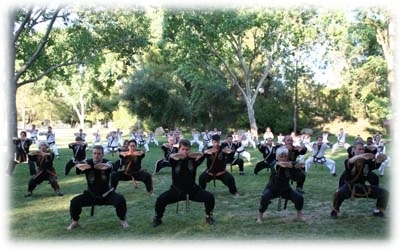 Thank you (all instructors) so much for the opportunity to meet Chong Su Nim. I have dreamed of meeting an enlightened man since I was 19. Words seem cheap here, and I have not digested it yet. So for now, only ‘Thank you’ is all I can think of. I guess ‘thank you for giving your life to others’ – it’s all a little too close to home to say anything else… when I was a child, I wanted to save the world. Maybe at some point I said ‘the world and go save itself’, maybe it’s time to rethink that. In addition to training and dedication to students, and your time and caring, thank you for your patience with me. This weeklong was a very different experience from last year’s weeklong. During the past year, I have changed in many ways and I found it easier to move and easier to absorb movements this week. The meditations were interesting and surprisingly gave me an opportunity to learn more about myself. I am thankful to everyone who made this week possible. I woke on Wednesday feeling rather sore from training on Monday and Tuesday. The midday meditation changed all of that. I managed to fall into a deep meditative state for a full hour. Afterwards I felt more peaceful and calm than I ever had in my entire life. When I started my afternoon practice I noticed that my soreness was gone and I could move more easily and get into better positions. I look forward practicing my weeklong movements and meditation to improve my condition. Honestly, I feel tired. I feel a strange sense of energy – I woke up at 5:30 this morning and couldn’t go back to sleep and all the stiffness and soreness I had when I’d gotten up went away after I’d walked around for a bit – but I still feel drained. Someone asked me if things seem a bit clearer now. In a way they do, but in a way they seem much more complex. My outlook on practice was much different this week than it normally is. I never waited to stop practicing during the day; it seemed like an opportunity, which is what it is, instead of a chore, which is what I make it into sometimes at home. There was a lot in the weeklong that I feel like I haven’t even begun to digest. I still have no idea what to say about my chance to meet Grandmaster. I feel like I made some progress in my physical movement, but it seems almost unimportant next to the new directions and experiences I had in my meditation and the principles that I saw passed. My experience with Oom Yung Doe so far has been literally life-changing, so I’m certainly looking forward to seeing where all these new directions will take me when I apply them, but I have to admit that right now it’s still all pretty daunting. Also five days is not at all long enough. 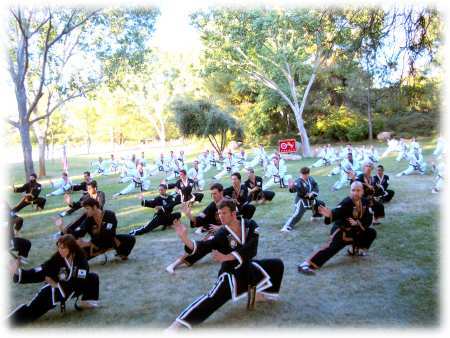 The 2006 Weeklong seminar was my first experience with weeklong training, and it proved to be a physical and mental challenge in which I personally saw a dramatic change in my physical condition and temperament from the beginning of the week to the end. Expecting a similar experience in 2007, I was very surprised to find this year’s seminar of even greater mental and spiritual challenge and benefit. 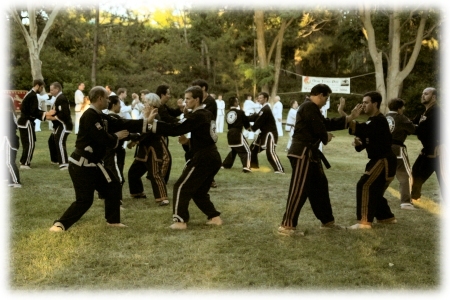 More than anything, conversations had between Instructors and students led to a more open and familial environment than I had ever been a part of before, and the direction passed down from higher belts throughout the week helped students and Instructors gain a better understanding of what they were doing, and how it would be important in every aspect of their lives. No one experience in this weeklong was as powerful or transformative than having the opportunity to meet Chong Su Nim and to try to absorb the Moo Doe principles which were passed to instructors and students. The 2007 Weeklong Seminar served as a mirror for me through which I could more clearly examine myself and have a greater comprehension of what I would need to do to make myself a better person. I felt a deeper feeling of peace from the Nae Shim Gong meditation than I have felt from any other type of practice, and know that I have only begun to feel the potential benefits of the movements. My sincerest thanks to all Higher Belts and members of the International Level Teaching Team for their patience, care, and respect in working with Instructors and students throughout the week. Thank you Chong Su Nim. There was this one time I opened a fortune cookie that read: If it is necessary it is possible. For me, I understood it in context of the Oom Yung Doe 2007 Weeklong Seminar. At the time I was a student trying to save my pennies to finance the opportunity. Going to the Weeklong was necessary; I just had to find out how I could make it possible. This “fortune” I thought was similar to one of the long boards in school; Where there is a will there is a way. Thankfully, I was able to make it to the 2007 Weeklong as a handsome graduation present from a dear friend. 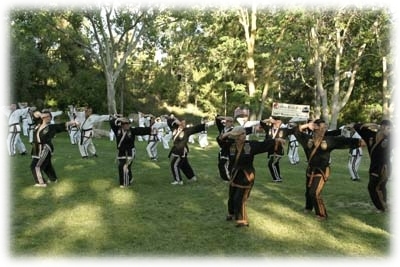 On the first day, as I walked to the field to greet Higher Belts, the Instructor that I first trained with (AHI Maurice), and friends I had not seen for a while (Kelly, Hannah, and Zoë), I felt an immediate calm overcome me. During dinner, I was unable to eat when normally I’d be hungry. Listening to personal accounts of others and the read experiences of Grandmaster, I became overwhelmed with a feeling of pure euphoria and excitement. I had never cried tears of joy, tears of happiness until then. I could feel the energy and feel the positivity. I was elated that I was going to be a part of it. I journaled later that night to try to understand my experience and all I could write was Love. Love. Love. I had never been a part of something so genuine before. Normally, my energy is really scattered throughout the day. I’ll get really, really excited about something and then crash immediately after; I had no stamina. However, even after the first day of training, I felt as if I could control and concentrate my energy. I felt calm throughout the day, but when it was time to prepare dinner, train, or anything else I felt I could almost direct that energy and not completely wipe out thereafter. I did not even feel as if I needed that much food or coffee to sustain myself throughout the week. I always thought that there were certain Instructors that were responsible for me, Assistant Head Instructor Ben, Assistant Head Instructor Maurice, Assistant Head National Instructor Joe, but throughout the week there were Higher Belts, Regionals, and Assistant Head Instructors who helped me with movements, passed wisdom, and shared themselves with me in such open and honest ways. It seems as if everyone just looks out for one another. Oom Yung Doe is more than a community of people who are devoted to live their lives by the same principles, it is a family. At times, this is difficult to grasp in contrast to my own family, who do not support my training or the way I have chosen to develop myself physically, mentally, and spiritually through Oom Yung Doe. But I have left the Weeklong with principles that will help guide my relationships with my family into a healthier and more positive state. I tend to over-think things, including movements. Higher Belts advice to relax helped me remember movements and go through them better. Sometimes, I will compare my training and experiences with others and doubt myself. However I am beginning to learn that my experience is my own, it is my own development. The Weeklong has helped me want to develop myself into a person of discipline and integrity. Up until the Weeklong I just viewed Oom Yung Doe as a way to simply develop a more balanced and holistic life two hours a day, five days a week. But as I learn to doubt myself less and less, hopefully I will find a way to earn what it is I have learned within Oom Yung Doe. I feel more centered balanced clam and focused: Thank you. This weeklong has surpassed my expectations. The strong movements and meditations that were passed was only the beginning. The weeklong gives students and instructors the opportunity to not only grow and develop individually, but also as a community. In not even a weeks time I already feel close to those I have just met. The sense of closeness I feel to my fellow students is incomparable to any other such experience I’ve had in my life. Some of the benefits I have noticed about immediately during the weeklong is an increased amount of energy as well as an increased amount of focus and concentration. I have sleeping issues where I almost always feel exhausted even if I get 8 hours of sleep. I could get up to 12 hours and still feel sleepy. At the weeklong I’ve waken up at 5:00 everyday and had tremendous amounts of energy to expend. Even after 6 hours of practice I can still go outside in the middle of the night and practice and feel rejuvenated. For as long as I can remember, I’ve had trouble concentrating. Even at school taking exams I would find my mind wandering. With the meditation movements learned at the weeklong I am noticing for the first time my mind is at ease and I am not thinking about 10,000 things at once. I’ve notice these few benefits after only a week, I can only imaging and look forward to what else is to come after consistent practice over the next few months. I am very grateful for the opportunity to attend the weeklong, I am also glad there is a weeklong for myself to attend. A week spent with compassionate instructors, a growing family, and no distractions from training with movements that have changed (and are continually changing) my life. 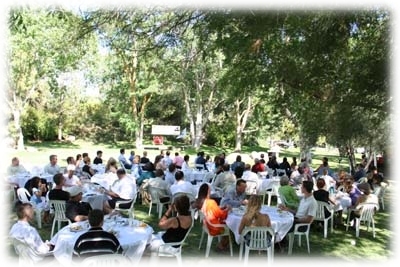 The experience of learning so very much in an outdoor setting with the remarkable energetic force, is and shall continue to be, a worthy benefit. I am truly grateful for the opportunity to benefit from the training from so many experienced instructors. 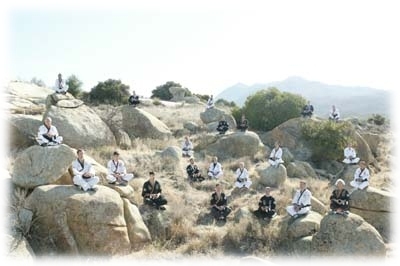 Through the meditation technique of Nae Shim Gong I experienced a deep sense of humility, as well as seeing a single pathway to my goal of attaining inner peace. I have felt my sense of fragility decrease as a strength of spirit grew. I find a whole new meaning to the cliché “light at the end of the tunnel”. The opportunity to meet my fellow students from all over the country was pure Joy, I learned from them as well. 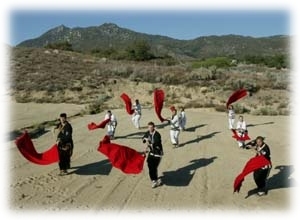 I found the movements at this year’s week long in Warner Springs, CA to be superlative. The movements were at a very high level and challenging. 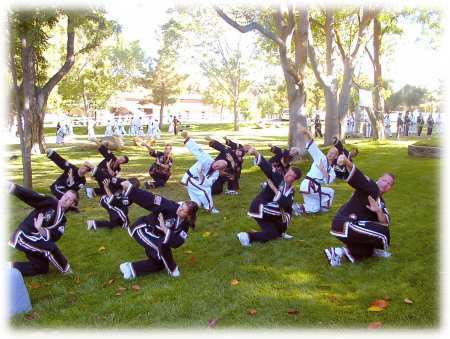 I felt that that I was developing all possible areas of physical and mental development through the movement. On top of that, I had an opportunity to purify myself and pursue spiritual clarity and enlightenment through Nae Shin Gong. The instruction in all these areas was first and foremost very generous. I can not thank the instructors enough for their generosity. The movement and knowledge they have is special and students are fortunate to find this knowledge. The higher belts providing the instruction balance the movement by the students and their concern and communication on many levels really was special and I appreciated it. Their sincerity, patience, generosity and manner are something to admire. 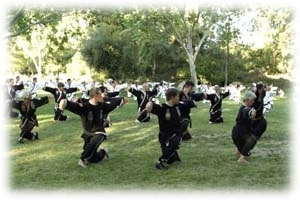 The direction about Nae Shin Gong and the path to development was very clearly explained by all of the instructors. Over the days, the conversations put together the physical, the mental and the spiritual portions of our training. 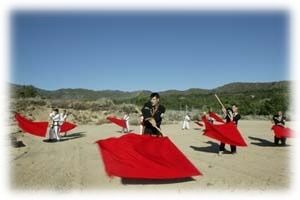 One thing that I really liked is the explanation of Nae Shin Gong in relation to training; Head National Instructor Jerry explained to me that the physical training that we do while beneficial, are like sands of energy that we are creating. This energy applied against visible or invisible will have the power of sand being thrown, which is namely not much. Nae Shin Gong cements these energies that I am creating into something solid and substantial. I actually did feel very solid on Wednesday night after this conversation in a way that was different. 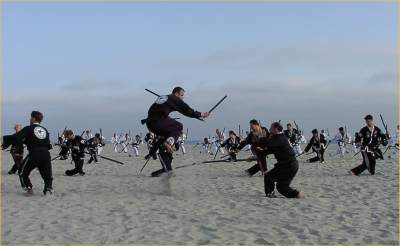 Knowing how Nae Shin Gong affects my personal practice shows me how important Nae Shin Gong is to all aspects of training and will help me practice it with better direction and knowledge. I want to thank the instructors for giving me the path to not fool myself, as I remember Grandmaster Iron Kim saying; to make the most of what I have. I started Moo Doe training last year at the age of 60 and reached my 61st birthday shortly after attending the 2006 Weeklong Seminar. 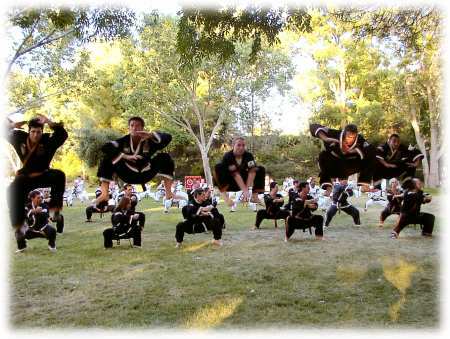 At that time, I was a 1st section and had been training for only two months. Therefore, I felt that I knew what to expect from the 2007 Weeklong Seminar and eagerly anticipated it for weeks as I felt that I would gain even more from this year’s seminar. During the seminar, many students and instructors who remembered me from the 2006 Weeklong told me that they could see that my condition had changed in the past year. They told me that I looked younger, that my eyes were brighter, and that they felt more energy from me. They also told me that I no longer had dark circles under my eyes and that wrinkles were disappearing from my face. During the week, I had deeper experiences than ever before when meditating and saw distinct images on one occasion. This had never happened to me before! The movements also had a profound impact on my body and after returning home, I found that my flexibility had increased and that there was a positive change in the alignment of my chest and shoulders. My instructors also remarked about a positive change in the way that I carried myself. I wish to thank Grand Master Iron Kim and the International Teaching Team for sharing the knowledge that enables one to improve their physical and mental condition in such a short time. The 2007 Weeklong Seminar has been a life changing experience. I was greatly challenged physically, mentally and emotionally to overcome my fibromyalia. This challenge started before the Weeklong began since I also had motion sickness. The trip from Florida to California was very tough on my body. I had never been on such a long flight and had never gotten so sick on a plane before. By the time I arrived to the room at Warner Springs Ranch, I was completely dehydrated and my entire body was weak and shivering. I had been incoherent most of the time during the trip, but I made it to my destination with the help of a fellow student who showed great patience and care in every way including carrying my luggage, since it was enough of a challenge for me just to walk from one destination to another. She communicated with instructors about my condition and continued to take care of me that night. The next day (Sunday), one by one, instructors and students came to see how I was feeling. It was a heartwarming experience where I felt the love and care of a family. As I met other instructors and the international teaching team, I was asked how I was doing and was offered advice to help me recover and make the most out of the week. The genuine care was evident the entire time. Not only did my weakened body recover, but I grew stronger with each lesson and my body harmonized to the point were I was able to fly back without getting sick. I accomplished this not only with the strength of the training, but with the personal attention of the international teaching team who took the time to find out what I should do just before and during my flight back to FL. I was given Chi herbal patches to place on pressure points near my wrists and was shown other points to press. 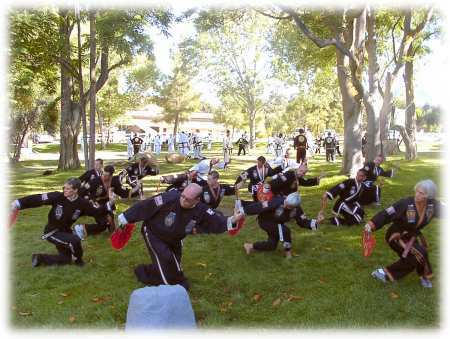 I did as advised and did the Nae Shim Gong meditation taught during the Weeklong. The result was the best flight experience I have ever had since I started having motion sickness as a child. Now I know I will never have to deal with this issue again, and I know from the improvement of my condition during the Weeklong that my body will one day be harmonized to the point were that alone will keep me from experiencing motion sickness. The Weeklong experience was worth every challenge I had to undergo before and during the week. 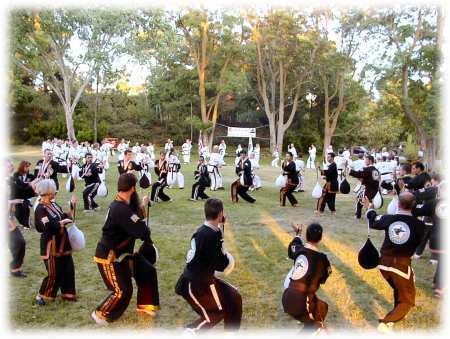 The energy of the environment, the movement, the personal attention and the family bond formed with other students and instructors is extremely healing. To any student who is letting their present condition get in the way of attending the Weeklong, I would say be strong and have faith because it is by attending that you will greatly improve whatever condition you may have. 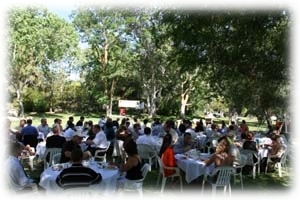 At last years weeklong I felt the strongest sense of togetherness & peace, from each individual, than I had felt anywhere. This year’s weeklong surpassed it. I’m not only amazed, but truly thankful for the depth of knowledge Grandmaster “Iron” Kim passes down to benefit students lives everywhere. The movements & meditation this year helped me not only continue to improve my physical condition, building strength and flexibility. Through the meditation I felt a connection to something spiritual. This connection filled me with a sense of purpose. A purpose I plan to utilize, continuing to build happiness & peace in individuals everywhere, starting with the Largo school. The 2007 weeklong has been a special one for me. I have felt a great many benefits from this unique training. The greatest of these benefits is a renewed sense of inner peace. I believe that this inner peace has been brought about through the practice of Nae Shin Gong and the meditation that goes along with that practice. 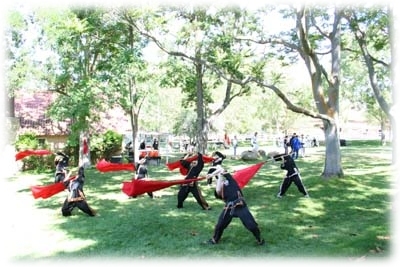 There is something special that comes with practicing Oom Yung Doe, that is when ever we gather together we are not individuals coming from all over the U.S.A. to practice but members of a family reuniting to once again share in the unique experience that is the weeklong. 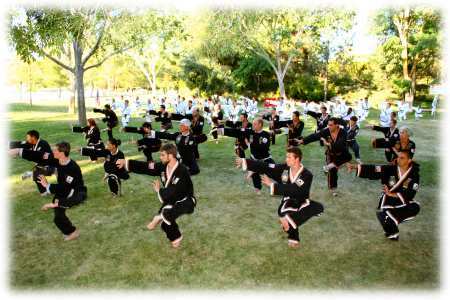 The energy, calmness and clarity of focus I felt from this years’ weeklong training seminar was extraordinary! As I continued my training each day, I could feel my energy increasing and my focus becoming clearer. I felt a calmness and feeling of inner peace during, and for hours after, my meditation that I have never felt before. A heartfelt thank you to Grandmaster Iron Kim and the International Teaching Team for providing myself and other students with this opportunity to travel this road toward mind, body and spiritual harmony and for this amazing weeklong experience. I am a single mother who teaches the children and teens class at the Oom Yung Doe School in Winter Springs, FL. I work full time as a group therapist for the severely mentally ill and I go to school full time for my Masters in Mental Health Counseling. Coming into the weeklong I was exhausted mentally, emotionally, and physically. I practice on a regular basis and this practice helps me have the energy to handle all that I am, however, I felt I needed a boost. Throughout the week I felt my body get stronger while my mind became relaxed and peaceful. At the end of the week my cup was once again full like it always is when I am around higher belts. I left the weeklong rejuvenated and ready to give back to my child, students, and clients. Having the opportunity to meet Grand Master was incredible. It wasn’t what he said that struck me as much as how he said it and how his character shown through in every word and move he made. I felt that all the principles that are hanging on the walls in the schools, spoke about in the schools, and read about in The Master Key of Wisdom were displayed perfectly in Grand Master. In the beginning of the conversation his strength was evident, later in the conversation he was cracking jokes showing he has a sense of humor, and as he closed he seemed gentle and kind. I am very thankful for the opportunity to meet Grandmaster. The weeklong seminar has been a refreshing experience. Learning the different forms in a natural environment has been challenging but enjoyable. Of note, my sinuses have cleared this week which has been a dramatic change from my constant state of congestion and difficulty breathing. As a result of my training this week, I am breathing better which has helped me to feel better overall. The tea, herbs, and equipment have been helpful in enhancing my practice as well. This week has been invaluable in building my physical, mental, and spiritual condition. 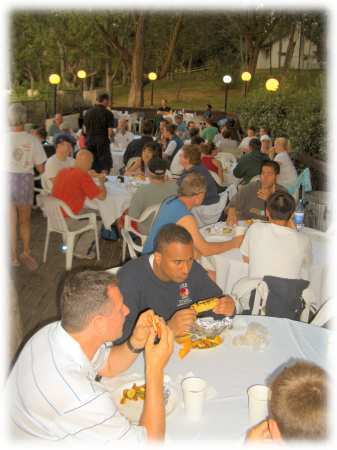 The 2006 Weeklong Seminar was an extraordinary experience. 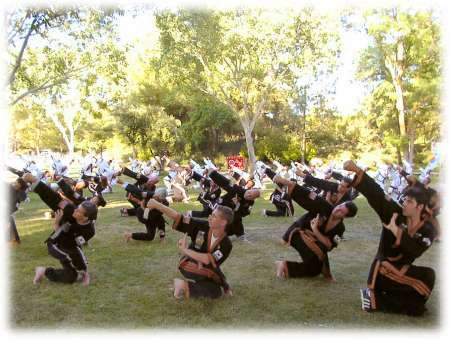 The physical and mental benefits to both instructors and students were overwhelming, while the compassion and camaraderie between practitioners left me deeply moved. The first benefit I received is the energy from the environment which helped to revitalize me. 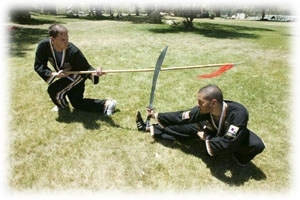 The training was consistently challenging. There were areas of my body that were re-awakened to new heights and challenges. Just as rewarding was the camaraderie and the sense of working together as one. This was truly a great experience and I look forward to returning next year. Thank you to Grandmaster and the International Level Teaching team. There were some obvious benefits from this weeklong that I shared with other students. The forms I practiced left me feeling very calm. 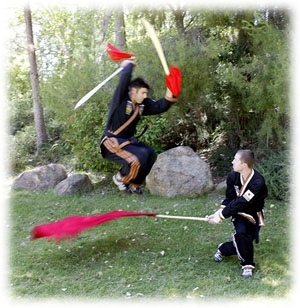 The personal adjustments and time spent with such highly qualified instructors is something everyone should experience. There were a few movements I was “stuck” on, however, the explanations from Higher Belts were always so clear. 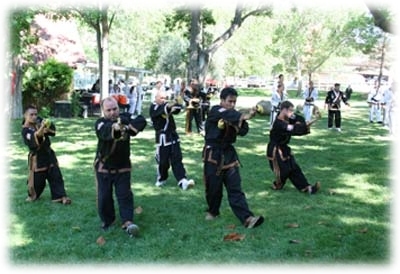 I felt comfortable with the sequences and was able to learn the forms quickly because of direction from Higher Belts. An even greater benefit was to be able to spend time with Higher Belts. At the beginning of the weeklong, there was much talk about seeing the invisible and spirituality. I felt a little overwhelmed as I did not feel open to these aspects. When I could meditate or attempted to figure out my thoughts on the invisible, everything became cloudy. I started feeling a little guilty about this as if I was cheating my practice because I didn’t know where I stood on these issues. After a conversation with a Head National Instructor, I began to understand the principle of “knowing one’s self” which helped me to see the direction my practice more clearly. As my first step is to see my true self more clearly, this conversation reminded me of the main reason why I practice. The manner in which Higher Belts can see where you are standing and how they so clearly explain where you need to go is truly remarkable. When I arrived at this year’s weeklong seminar, I felt as though I was carrying a heavy load of stress and anxiety that I had accumulated from my daily life. After several days of practice, I not only felt as though that weight had been lifted from my shoulders, but that I have positively improved my mental focus and concentration to better handle the situations that brought about my daily negativity. I also feel that I have been taught a way to better understand myself, mentally and physically, and also what I need to practice, whether it is movement or meditation, to bring about this release. I would like to thank Grandmaster “Iron” Kim and the International Level Teaching Team for this opportunity to better understand how to bring about positive changes and improve the quality of my life through Traditional Moo Doe. I have been attending the weeklong seminar since 2001 and I have seen distinct differences in every weeklong. It seems to me that the weeklong seminars, since I have been attending, started with more physical movements and have gone more towards the spiritual aspects. This year’s weeklong was clearly more towards the spiritual, you could see it in students’ faces. Some students I have talked with have had profound experiences through the meditation. I have always had difficulty getting comfortable during meditation because sitting in a cross legged position has been challenging on my hips. This year, during the meditation, I felt a “pop” in my hip and it felt like my hips popped into place because for the first time I could sit cross-legged comfortably for an extended period of time. I have always looked for a deeper meaning in my life and I always see it when I am around Higher Belts. This year I had the opportunity to meet with Grandmaster and he encouraged us to look beyond what we think we can do and that spiritual enlightenment was within our grasp. I would like to thank Grandmaster and Higher Belts for providing us with a way to achieve a more balanced life and the tools to show others that can achieve these qualities as well. This year’s weeklong seminar was amazing. The weeklong has convinced me that this is the fastest way to meet my training goals and to continue to challenge myself with new ones. This week has also reinforced my belief that this training is very deep and can provide incredible benefits to anyone who practices. All of the students and instructors from Pittsburgh felt like new people as a result of this weeklong. I am very thankful to Grandmaster and the International Level Teaching Team for all of the benefits I have seen over the course of this week. This year’s weeklong seminar has helped me to see my life more clearly and where I would like to be in the coming years. The combination of the environment, the movement, the herbs, and the tea has allowed me to flush my mind and body of its toxins and bring energy into my body. Every weeklong I have attended has left me feeling stronger which has allowed me to live more comfortably on a daily basis. I know that I have continued to receive these tremendous benefits from this week’s training. At first, I had reservations whether I would be able to handle higher level forms because of my age and condition. The support and guidance from the National Instructors helped me tremendously. By the end of the week, my flexibility had improved as well as gaining new insight into myself through meditation. I especially benefited from movement designed to release negativity and recaptured a peacefulness that is so often lost in my everyday life. Thank you Grandmaster and the International Level Teaching team. The 2006 weeklong seminar was incredible. After just 3 days I felt a great increase of energy. Waking early in the morning and helping setup breakfast through a day full of movement and then soaking at night outside in the hot springs left me feeling energized. 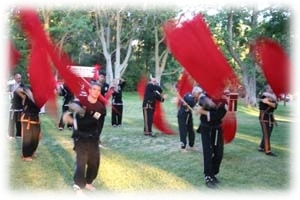 The location was conducive to the movements taught and a wonderful place to be. I will not soon forget meditating in front of mountains or smelling the hot springs in the morning as I walked to practice. I was sad to leave. 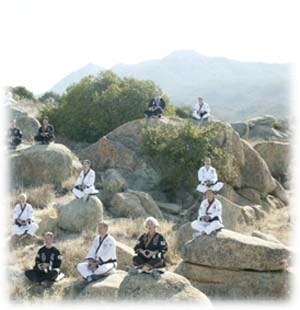 I am thankful to Grandmaster and to Higher Belts for all that comprises the weeklong seminar. 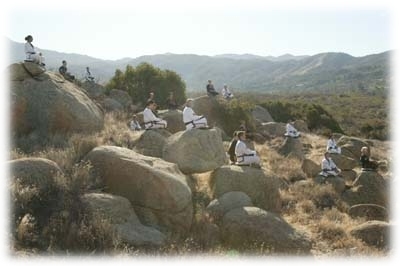 Each day in the mountains at Warner Springs I saw an improvement in my internal strength. By allowing myself to learn I can see the difference and improvement of range of motion, stamina, and development of mind and body harmony. Best investment to self ever. A list of the benefits I’ve received from this year’s weeklong would include much better focus, clearer and calmer mind, increased strength and fluidity to my movements. I feel that after just a week I was at a point mentally and physically that would have taken several months or a year of training to reach. The meditation practice for me, yielded a greater sense of reaching a point of zero/nothingness. This meant a lot for me since I was able to stop my internal dialogue for much greater lengths of time than ever before. Normally my right eye is much stronger in vision than my left eye. I began seeing and feeling an electrical current around my eyes when I maintained meditation past 10 minutes. By Friday of that week my left eye vision had improved significantly, it is now equal to the right eye. This is astonishing when I think about it even as I am writing this testimonial I look around the room testing my now balanced and excellent eyesight and it seems like a small miracle that this has happened at the age of 37. I am deeply grateful to have the opportunity to experience the deepest healing power of my own body through traditional moo doe. To anyone that has not attended a weeklong and appreciates their training thus far, try it and you may change your life and how you view it, literally. Sincere thank you to the patience and wisdom of the International Teaching Team, Thank you Chong Su Nim. The place itself was magnificently beautiful and highly energetic. The main reason I go to the Week Long Seminars is to release the negative that builds up during the course of the year and to have the focus of this year’s Week Long Seminar be purification was an added bonus. This was my first weeklong. I was nervous that the training was going to wear me down really fast, but to my surprise the matched training and equipment allowed me to keep going all week. Also the movement targeted some very need to work on areas in my body. I was also happy to talk and spend time with higher belts. I feel cleansed, rejuvenated, and refreshed. The association with other Moo Doe practicioners, the activities, the movements – even making food – has been a respite from the negativity that is so prevalent in the world today. I truly feel like this is an extended family, and I have enjoyed every moment I can spend with them. I will leave this weeklong with a greater understanding of my mind, body, and spirit – and with a sense of peace that I know will stay with me even after I return to daily life. I am truly thankful for the opportunity to learn from the International Teaching Team, and through them, from Chong Su Nim. I can’t wait for next year’s weeklong! Spending several consecutive days among National Instructors, higher belts and other students helped me to see the many different ways that Moo Doe training benefits individuals and creates a community. There’s no doubt that I’ve gained physical benefits. I’ve realized mental and spiritual benefits as well. I used to have some trouble relaxing into meditation. Now, it seems more natural. In my experience at the Oom Yung Doe weeklong, I not only bettered my body and mind, but my soul as well. 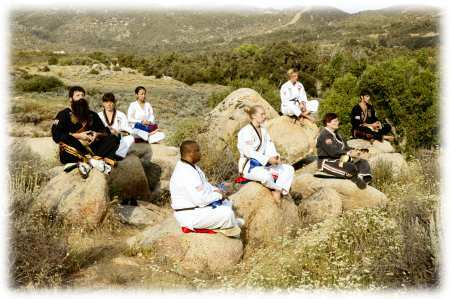 While attending the 2005 weeklong in Warner Springs, I was given the opportunity to train along side higher belts and with students from all around the United States. One of the many things I noticed was how everyone looked out for each other. 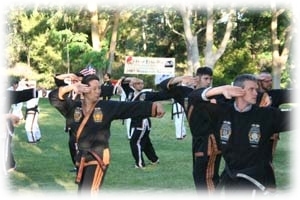 The National team always took time out of the day to check on every student and instructor. Instructors who were new to me were always concerned and checking on how I was doing. Students working together in groups supported each other and helped one and other. It slowly but surely became clear to me that at this weeklong we all were not only training our mind and body, but that we all were forming a family. The students of the School of Oom Yung Doe, no matter what state they are from, care for everyone around them. I felt at home with these people I had only met a few days before. By the last day I found myself not wanting to leave such a good environment. I had made a bond with everyone there, and this bond has made me stronger. No matter what I do or how hard Training might seem to me now, it is comforting to know that I have my own blood family and my family from the School of Oom Yung Doe behind me to support me. There isn’t any other better feeling in the world. This was my first Weeklong Seminar and it has been an incredible experience. I have taken several steps towards improving my condition with the movements passed this Weeklong. 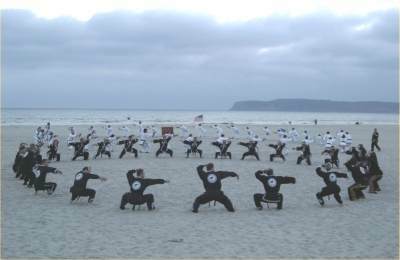 Training on the beach with the right movements, using equipment and herbs was such a positive experience that I’ll never forget. I feel completely renewed and alive. The weeklong seminar was a great experience for me. The use of herbs, possibility of interacting with the higher level instructors and friendship of fellow students was amazing. I will be back next year. My 80 year old mother says that anyone can do well when life is easy, and that one measure of a person’s character is how they cope during difficult times. 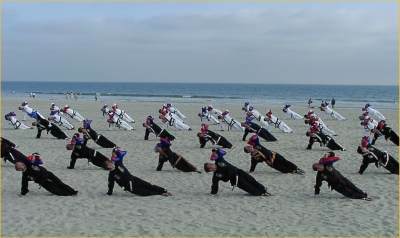 I learned much about my character during this Weeklong Seminar in the deep sands of Coronado Beach. This year in the Weeklong Seminar I learned a great deal more about how I handle challenges. There have been several “defining moments” in my life when I have truly seen myself, and while they aren’t always pleasant insights, they do lead to personal growth. I think I experienced another such moment in this week. With gratitude to all my instructors for the opportunity to learn from you. An unexpected result of this week of training is an end to my poor circulation. For years I’quot;ve had really bad circulation which ended up weakening my endurance and more visibly cold or even numb fingers and toes. While everyday training at the schools gave temporary relief to this the weeklong seminar seems to have cured it, my fingers and toes are warm and I can train for a lot longer and more intensely than before. I feel a dramatic change in my ability to move and my understanding of movement. Physically I feel more balanced than I ever remember and mentally I feel calm and clear. This has truly brought me to a higher level and reset my condition for some time. After the first day of lessons I was concerned because my Achilles tendon injury was bothering me; but I got the chance to apply an herbal patch and it really helped. I was then able to continue going through the lessons unhindered. I found the movements challenging but felt like my strength increased with each lesson. After what should have been a long day of movement I found myself with energy, but more than that I found real joy! Meeting new people who are like minded is great! I had never planned to attend the weeklong seminar. Just a few months on the International training program, my mind gave me the usual onslaught of thoughts to hold me back: “I can’t take the time off, I’m too new to training, I’ll never be able to keep up, I can’t afford it.” I am so glad that I found the strength to overcome these negative thoughts and made the decision to attend the weeklong seminar. The truth is, how could I afford not to take the time off and invest financially in a week that could positively change my life physically, mentally and spiritually forever. 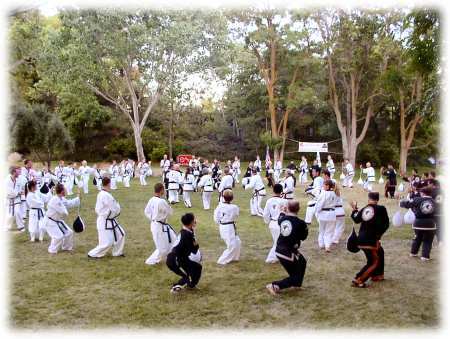 Attending the weeklong seminar also showed me that it doesn’t matter where you are on the training program – that the teaching is designed to help everyone and that even the white belts will benefit. As a second section, I will leave this week knowing myself better and my practice will never be the same. The seminar made me push beyond what I ever thought I was capable of doing. It brought out an inner strength that I didn’t know existed. In a week, I have gained more confidence than I’ve had throughout my life! The week also inspired me to push further in my training. Seeing the higher belts practice gave me a chance to see what I could look forward to. Seeing the different ages and body types showed me that practice is very personal and that this is true Moo Doe. The teaching is priceless. The seminar is worth far more than what we invest. The knowledge that is passed on with the forms will benefit not only my practice, but will help me daily with my life. The most important thing I’ve learned this week is the power of my breath – how it can give me more energy and strength. This weeklong seminar has been the most rewarding week of my life. I know I will never be the same and that the lessons learned, both physically and mentally, will take me to a higher place. Thank you, Grandmaster for sharing your knowledge. Thank you, Instructors, for teaching me the valuable lessons and for your patience and kindness. I am forever grateful. This year’s weeklong seminar has dramatically increased my strength. During the first two days I experienced more external development – by the end of the week, I could feel the internal development that my body was absorbing through the combination of the movement, herb and equipment. I can only describe the feeling as having a warm and vibrant body. 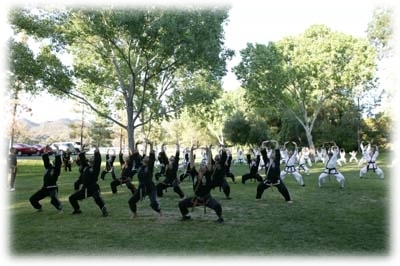 I thank Grandmaster “Iron” Kim for continuing to share his knowledge to improve the lives of others. In spite of, or perhaps because of, the fact that this was one of the most physically challenging weeklongs I have attended, I feel more energized than I have at any other time during my practice. The direction I was given on my movement and mental state made me much more aware of my internal strength. Although I wasn’t able to connect to I t every time, I could still feel what was needed to connect to my internal. The movement passed this week has challenged me at every level of my practice. Flexibility, strength, agility. Through these forms and the thoughtful instruction from the instructors has heightened my understanding of Moo Doe. I found myself being overwhelmed with joy when I was able to do some movements I thought would take longer to learn. The conversations with Head National, National and Asst. 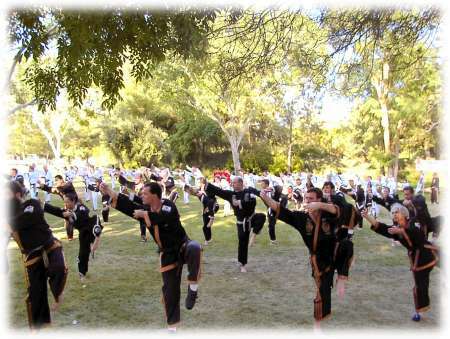 National Instructors helped me change habits that I will need to practice in the future. 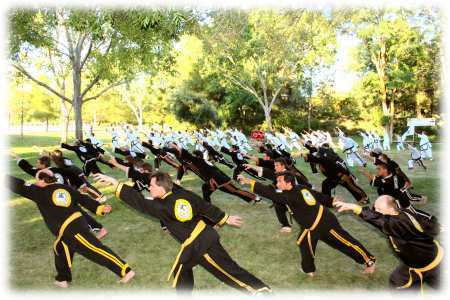 I am very grateful to all the instructors and especially Grandmaster. 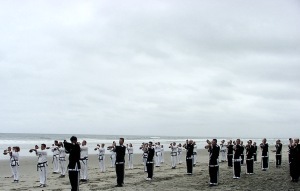 Six hours a day with 8th Degree Black Belts is amazing. Everyone is picking up these incredible movements. It’s just after the 3rd day and my body feels so much stronger all around. 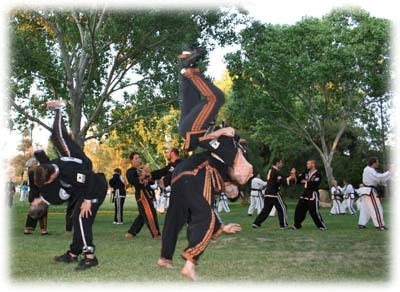 I think back to my old martial arts school, and these movements are so much more advanced. I can’t imagine ever not practicing Oom Yung Doe. As with weeklong seminars of the past, I’ve felt phenomenal development and strength from the movement and seen changes in my ability in just the course of one week. As the years pass, I’ve come to have a greater appreciation of lessons in leadership, teamwork, camaraderie, character, and having deeper meaning in the way we live our lives. I’ll carry new lessons home after this week. The weeklong for me has been a real test of my mental growth. The first two days of new movement not only challenged my body tremendously, but also coordinating my limbs to move challenged my concentration and mental state. It became clear to me that working through these frustrations for several hours was a key part of my development. By the third day I had the sequences somewhat down and then small adjustments were made here and there. It never ceases to amaze me how these small adjustments serve to open my body and my mind to the movement. I feel that after this week I have a much better understanding as to what my training is all about, unifying my internal and external through the movement, where as before I was just sort of going through a physical workout. The depth of Moo Doe training is extraordinary in the sense that there is always a deeper understanding that can be achieved, and I am happy that I’ve made the choice to do this. More so, the weeklong helped solidify my understanding of why I feel good about my training. I thought the weeklong seminar was fantastic. The movements passed were some of the strongest and best movements I have ever seen. The professional instruction by the International Level Teaching Team helped me to absorb the movements quickly and accurately. As the week progressed I began to feel extremely good and harmonized. By the end of the week I felt fantastic. I felt very energized with a very warm and tingly sensation throughout my body. I felt as though I was able to balance my condition and absorb Nae Gong Energy, while developing physically. I am very satisfied with the results of the Weeklong. I feel the best that I have ever felt after this years Weeklong Seminar. This is the strongest training I have ever experienced. I have benefited greatly and learned movements and principles that I can continue to absorb and apply to my life. I will benefit for years to come. 2004 Weeklong was the strongest Weeklong I’ve attended. The movements were felt deeper than I have ever felt movements before. This years event showed me where my training needs to be. This years Weeklong helped me to reset my focus, re-harmonize my mind and body and to re-balance my life. The movements passed were taught in a manner that made them easy to memorize, which allowed me to focus more on the principles. I look forward to applying the knowledge gained this week to my life and to those around me. As a result of the Weeklong Seminar, I have come the closest I have ever come to a balanced condition. There are so many factors that have contributed to this: the training environment, the tea, the Chi Herbal Bath, the attention, care, and instruction of the International Teaching Team as well as the movements themselves. My hip flexibility has been one of my weakest areas for the duration of my training. 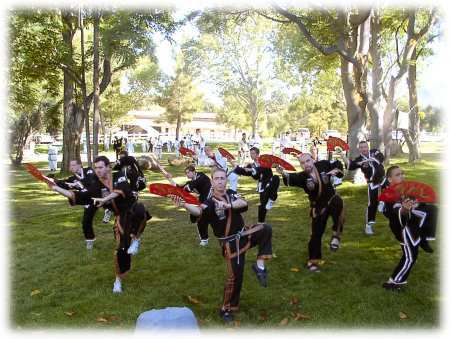 In the first day of the Weeklong I felt my hips opening up from Dancing Dragon 2. The Weeklong has opened my eyes even further to how beneficial training can be. Forced to use my mind in order to challenge and understand the movement. 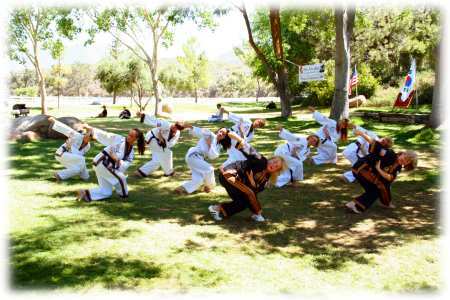 Instructors said to relax and not fight the movement otherwise you will injure your body. 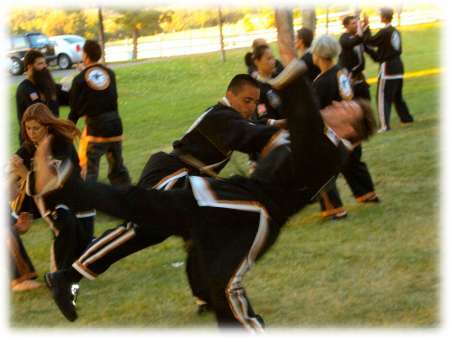 By reminding myself not to fight against the movement, it prevented me from further injuring my shoulder. 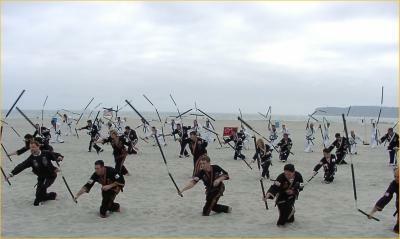 I liked practicing at the beach and I got to meet many other higher belts and students. I was also happy to meet Grandmaster “Iron” Kim. It was a great opportunity. I’ve found these movements for this weeklong to be extremely beneficial because starting Moo Doe at the age of 40 I have always struggled with whole body movement. Now being able to move the whole body with more control, speed, accuracy, and strength is like poetry in motion. 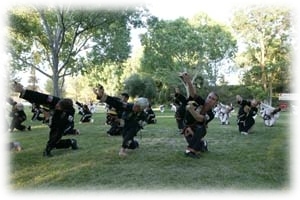 I have also found as my practice progresses this type of movement is fitting my body more and more. I attribute this to the International Program because I have seen and felt the progress of myself and other students. Thank you. My best investment ever! Herbal Tea and Bath Herb equipment helped free joints, Mind, Body, and Spirit (better posture and ability to take fuller breaths). Expanded connection and respect to all that is. Develop more presence, focus, balance, strength, contentment, compassion, and peacefulness. A true thankfulness and humble appreciation for Instructors. Both nurturing and challenging. Expressive pride and passion for this path. Very empowering. I felt my energy level increase everyday that I trained. Even though I felt sore in the morning, by mid-morning all complaints were gone and the energy level increased continuously during the day. 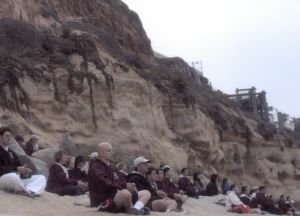 This seminar was a complete mind and body experience from the various forms of herb to the ocean, sand and movement and words of encouragement from the Instructors. This Weeklong Seminar exceeded all my expectations. The Seminar was so comprehensive and holistic. I appreciate the fact that each day’s program incorporated all three aspects of Traditional Moo Doe training-body, mind, and spirit. As a result I felt increasingly energized throughout each day, as well as each day building on the previous one. I am amazed at the difference I see in the way my body moves and feels. In just one short week I feel more “pulled together”. I am able to move more naturally and more fluidly, and I actually feel more comfortable in my skin. I also feel so relaxed and at ease. My only regret is that I can’t stay another week! I’m very grateful to the International Team for the very special care they’ve taken due to my situation (5 months pregnant). They gave me forms that brought me a deep feeling of peace. Always taking time to check how I was feeling and to explain and adjust when necessary. This training helped me focus on my breathing and on a state of calm, both beneficial for the baby and me. This year’s Weeklong Seminar has improved my condition tremendously. During the first two days of training, I felt quite a bit of muscle development in my lower body, which hindered the fluidity of some of my movements. But by the end of the week, my body was able to relax and allow the momentum to control the movement. I attribute this change to the combination of the movement, teas, herbal baths, and meditation that Grandmaster has provided and I thank him for providing a way for me to harmonize my condition. From this Weeklong, I feel I have a better understanding of myself. I was able to see some areas of weakness, and also how to help correct those weaknesses. After only one week of training, although sore, I feel that I can move with more strength than ever before. From the conversations, I also think I have a better understanding of Traditional Moo Doe and how to better communicate with others. This Weeklong was the greatest mental and physical challenge I have ever faced! But the development I have received from it was worth it. The care, and attention shown by the International Instructors allowed me to gain more from these five days than any other time in my training. This type of training is awesome. This amount of power and coordination that I have gained is tripled. The amount of form passed down is just enough. My body hasn’t felt this way since my twenties. I hope that I can comeback to the Weeklong next year. This was the strongest week of training I have ever had. The movements combined with the terrain and herbal equipment provided a new challenge I had never experience. 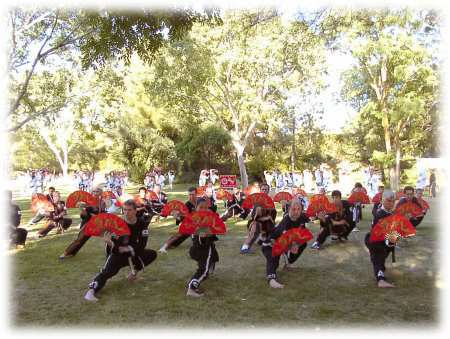 Every single movement of Pal Gae Quan provided tactile sensation in parts of my body that had notoriously been underdeveloped or even neglected. With the other forms I feel like my body control and changing directions has dramatically improved. Here again training on sand provided its own challenge. I feel completely renewed. I cannot wait to get home to continue practicing and sharing my experience with other students. 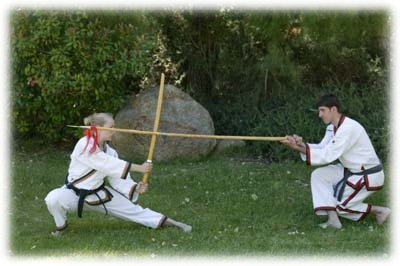 I had no previous experience with Oom Yung Doe training prior to this seminar. I was impressed with the variety of styles as well as how extensive my program was. I was honored that I got to work with a Head National Instructor. In my 2-day experience I was able to get a glimpse of how Moo Doe could strengthen me physically and mentally. 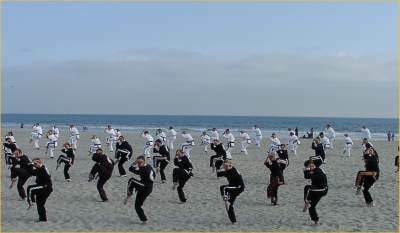 Practicing on the beach was a challenging and enjoyable experience. The instruction challenged me both mentally and physically. I particularly gained an understanding of how to better utilize my whole body during the movement. I felt that there was a great opportunity to understand principles of the movement because of the common themes of whole body utilization, timing and coordination. For me, this year’s Week long seminar was a tremendous physical and mental experience. The lessons taught each day focused on many principals involving how to use our body for more balanced and complete practice and development. The National Instructors engaged our minds on a high level and by rising to the challenge I feel I have grown considerably this week. I always look forward to sharing what I learned at the Week long with students, my family and friends. This year was no exception. Where do I begin? Oom Yung Doe has changed my life in so many positive ways. The 2003 Weeklong has multiplied these changes exponentially. Physically, my body feels stronger and more flexible. Mentally, I feel more aware and much more focused. Last but not least, I feel as though I am a part of a huge family all with the same goal to improve our lives. This Weeklong has been very eye opening for me. I am better able to move connected. The mental and physical challenges that occurred have opened my eyes to see what we have. It is very clear that we have the very best training available. The Weeklong was a wonderful experience. The level of training from the International team is immeasurable. My body has changed greatly, and my understanding of how to utilize my body with movements was elevated to new highs. The ocean environment of the 2003 Weeklong Seminar was not only enjoyable, but I could also feel the benefits of practicing in this environment. The air is different here and I noticed that I was not out of breath as I normally would be, especially with the challenging movements we learned. Also, practicing on the sand was very challenging, however, I can feel that I’ve become stronger from the experience and I can hardly wait to see how I move now in a carpeted practice room! I have benefited in many ways, but the two main ways include physical strength and mental strength. Over a week time period I feel through practicing specific forms and movement combined with explanations from Head National Instructors the overall strength gained is immeasurable. Thank you. First, I would like to express my sincerest thanks to Grandmaster and all higher belts. 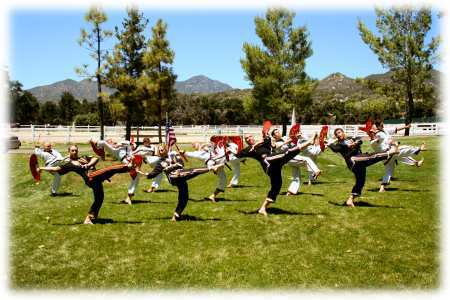 I have been training for 4 years, and have attended every Sae Gae Moo Doe, Weeklong, Weekend and ILT lesson. Although I have gained tremendously, I have never experienced this level of strength and balance in my condition. I feel after this weeklong seminar that I am a more attentive student, a more balanced Instructor and more human. There is a stronger drive inside me to pass on, but to also inspire and educate others on the importance of their mind, body and spirit, and the tremendously positive effects that Traditional Moo Doe can have on all of them. I’ve had a challenging week, both physically and mentally. My asthma would frequently interfere with my ability to focus on the training. I am grateful for the wisdom, patience and care that everyone had. With guidance, support and the use of the herbal tea, herbal baths and equipment, by Thursday I was breathing better, less stressed and able to relax and absorb the movements. Thank you all. This week has been an incredible learning experience for me – learning about Moo Doe, learning about students and schools across the country, and learning about myself. The training definitely pushed me beyond my comfort zone, challenging me to give it all I could, yet also gave me the feeling of strength, attention, caring and guidance from higher belts and Instructors. This week has been amazing for me. In just a few days I’ve felt my body move in many ways I never could before. My abilities have increased by at least double, if not more. I’ve also found that learning and memorizing forms, even multiple forms in a short time span have been much easier for me to comprehend and take in than ever before. I also found that moving my whole body together as one allowed me to practice much longer and harder with less strain and fatigue. It has been a wonderful experience and I hope to have the same experience if not better next year. I would like to thank Grandmaster and the International Instructors for making this experience possible. On Tuesday morning, I was feeling extremely bad. My mid section and stomach areas were really acting up. It was to the point that it was hard to focus on something else. As I started to practice I slowly started to feel better, but I was still struggling with fear, confidence, focus and trying to remember the sequence. At one point, I got so frustrated that I finally gave up trying and just let things go. As I started to do more and more of that I started to feel really good. At the end I was feeling great. Tuesday morning was amazing because I went from a real low to a great high. 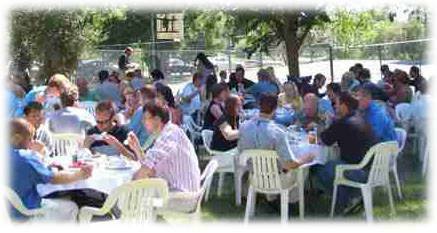 I recently attended the weeklong seminar 2003. In one week I saw my skill and ability improve more than it had in the last 6 months to a year. This alone would make the trip worthwhile, but I also came to an understanding of what Moo Doe training could do for me. It does more than just improve your flexibility, strength, and agility. It introduces you to your mind and body, their strengths and weaknesses, how to understand them and make them stronger, and use them to have a better quality of life. It is difficult to explain the feelings and benefits that I received at this weeklong seminar. The seminar is much more than new movements. I had an opportunity to learn principles behind the movements that will increase the benefits I receive in all of my training. Then having an opportunity to see Grandmaster will help me, in turn help all of those around me. This weeklong seminar was truly priceless. Meeting and talking with Grandmaster was a great moment, and was the most clear, thought out conversation I have ever had. He is a true living embodiment of what he says and teaches. The weeklong seminar was very intense for me in many ways. I rarely experienced muscle fatigue or shortness of breath, but it was more challenging for me mentally. This week, I learned to put more of my body behind my movement and even felt my lower body begin to really open up – and I’ve been working on the latter for several months now. It was more difficult for me to gauge and prepare for how my blood sugar and ways of thinking about things would react to the training and the change in my daily routine. By the end of the week though, I realized how truly individualized our training is and how responsible we are (in many ways) for that training. No one can really explain the deeper understanding they gain from training, but it’s something you have to begin to experience for yourself. This is my first experience with the weeklong seminars. I was not sure if I could manage to practice for several days for so many hours every day. But from the beginning, the whole organization of the seminar and personal attention helped me to get into the training and truly enjoy it during this week. The herbal equipment, baths and tea helped me to practice and to rest. New movements I got here gave me an opportunity to understand better my personal abilities and weak areas, gave me believe that I can develop myself in faster and more efficient way, realize how much work needs to be done, and set new goals for my future training. I feel much stronger mentally and physically. 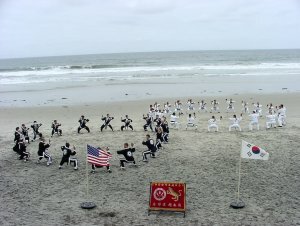 Practicing near the ocean was an absolutely unique and pleasant experience for me. Thank you very much! 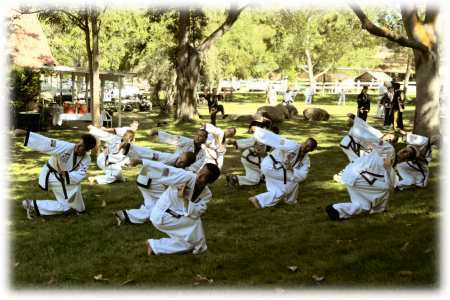 Because of the weeklong seminar, I have much greater confidence in my self defense, and my ability to move. I have a deeper understanding of Moo Doe after spending so much time learning from higher belts and especially from meeting Grandmaster. Hearing Grandmaster speak and asking him questions has greatly changed my view of Moo Doe, and what it can give a person. I now see what I wanted, what I can gain and feel better than I ever have before. My weeklong experience: I personally saw and interacted with the source of my connection to true Moo Doe. I also experienced the source of care towards myself and other students, which I see in higher belts. 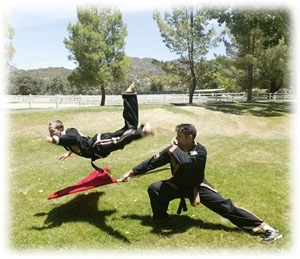 I thank Grandmaster for his commitment to pass Moo Doe knowledge as well as teach higher belts; this system allows all to change and improve at an impressive rate – more than I ever envisioned. This is the 2nd consecutive weeklong training session that I have had the opportunity to attend during my Oom Yung Doe training. After last year’s weeklong, I would have had great difficulty believing that that weeklong session could have been “topped”, but I can truly say that this weeklong training session gave me the opportunity to learn 3 times as much Moo Doe movement. As the week progressed, I felt my body loosen up. I became more willing to work with the environment and let my feet slide instead of trying to “stick” my positions. 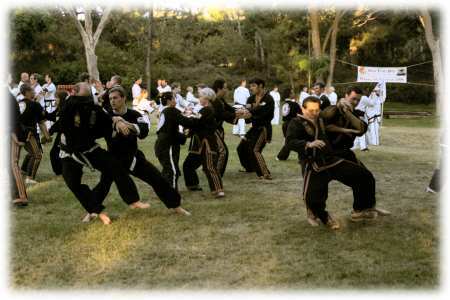 The availability of the higher belts made the week that much more beneficial to my practice. Thank you very much. In the past few months, my training has been neglected due to personal and financial difficulties. I was unsure about my future involvement and was planning to use this weeklong as a reset button and then make decisions concerning my future. Not only was I reset physically through movement, but also mentally by speaking with others going through exactly the same things. They were all an inspiration. I was clearly reminded of why I continue to push forward and the value of my training with regard to the whole of my life. 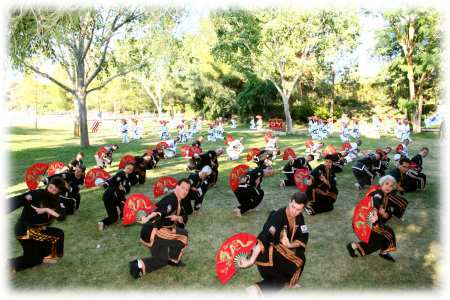 I feel that I learned an entire year of Sae Gae Moo Doe and International Level movement in 5 days at the 2003 weeklong seminar. I have never felt this well or been so challenged. This week of training far exceeded any of my expectations. This was a remarkable experience and I look forward to the next weeklong with great anticipation. This is my third weeklong and the best I believe. I have felt after each one that my body and mind move forward by more then I could hope from any single week of training. I feel that my ability to move my body as one has improved and my understanding of this Moo Doe system is so much better. I am looking forward to the convention. I now feel extremely confident and more comfortable with my training. At the beginning of the weeklong, I felt frustrated and overwhelmed with the new movements. By Wednesday, the sequences finally clicked and I was picking up the movements faster than I ever had or ever thought possible. This weeklong training has taught me patience, persistence and provided me with more confidence with myself and my movements. I can’t wait to take home with me all that I have learned and achieve and apply it to my current movements. My body feels stronger than ever, even where I had weaknesses in my knees and hips. My mind is more clear and I have a better understanding of Moo Doe mentally, physically and spiritually.